The review was a meta-analysis of randomized controlled trials regarding chronic pain management utilizing acupuncture. The analysis studied 39 individual trials, with a total of 20,827 patients that had either: chronic headaches, musculoskeletal pain, osteoarthritis, or shoulder pain. The main outcomes the studies measured were pain level and function. According to the analysis, Acupuncture was superior to sham as well as no acupuncture control group for each pain condition with the difference being .5 Standard deviation and .2 standard deviations. They also “found clear evidence that the effects of acupuncture persist over time with only a small decrease, approximately 15%, in treatment effect at 1 year.” That last sentence is an important one that shows that not only did acupuncture benefit the patients while receiving treatments, but the results were still being felt by the patient 1 year later which is huge when we as a society are trying to deal with chronic pain and the heavy reliance on opioids to deal with chronic pain. Meyers Leonard receiving cupping, which is a Traditional Chinese Medicine technique to help with his shoulder rehab. If you have any questions about Cupping and whether it’s right for you, feel free to call me at (360) 892-4355 and I can answer any questions you may have about it. 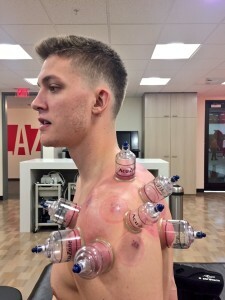 For those that have looked closely at the Portland Trailblazers Chris Kamen this season they might have noticed circular marks on his back which are a result of a technique called cupping. Cupping is a traditional technique that has been done with acupuncture for hundreds of years and some of the Blazers including Kamen and Nic Batum are utilizing it’s healing benefits. The general theory behind cupping is that it promotes blood flow and draws toxins out of the muscles quicker helping you recover faster from injuries and workouts. It also helps people circulate oxygen throughout their body better which is good for athletes and everybody else for that matter. Cupping is used in either plastic cups with suction pumps or with glass cups utilizing the traditional flaming cotton ball that pulls the air out before the cup is suctioned onto the skin. If you have any questions regarding cupping and what it can useful for, feel free to call me at (360) 892-4355 and I will be glad to answer any questions about it. My Doctor Said I Need to Exercise, But What Does That Mean?